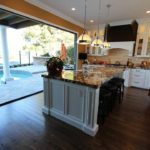 Comparing the before to the after of this Orange County home would make it difficult to see that it was even the same home. 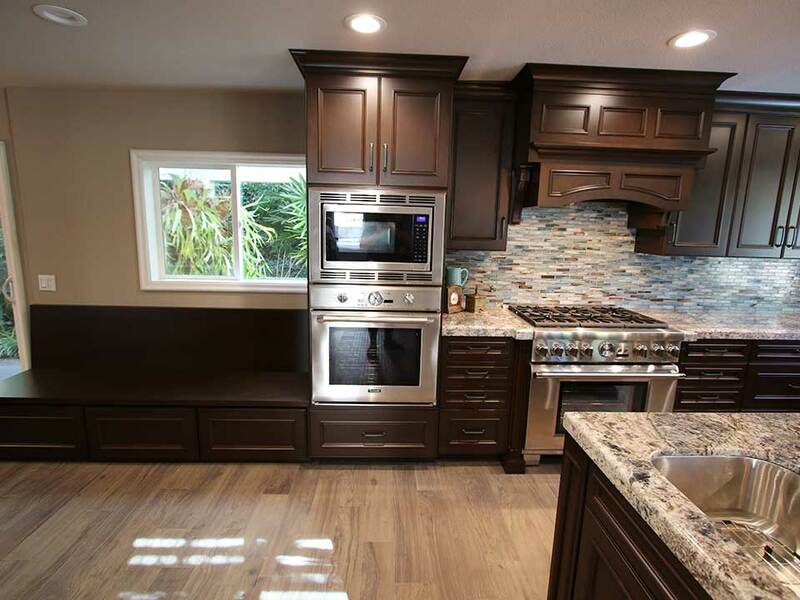 Before the APlus team started work, this Laguna Hills home featured a narrow, dark, closed in and incredibly small kitchen. The overall layout of the kitchen and living area was not just cramped, but was choppy and felt illogical. 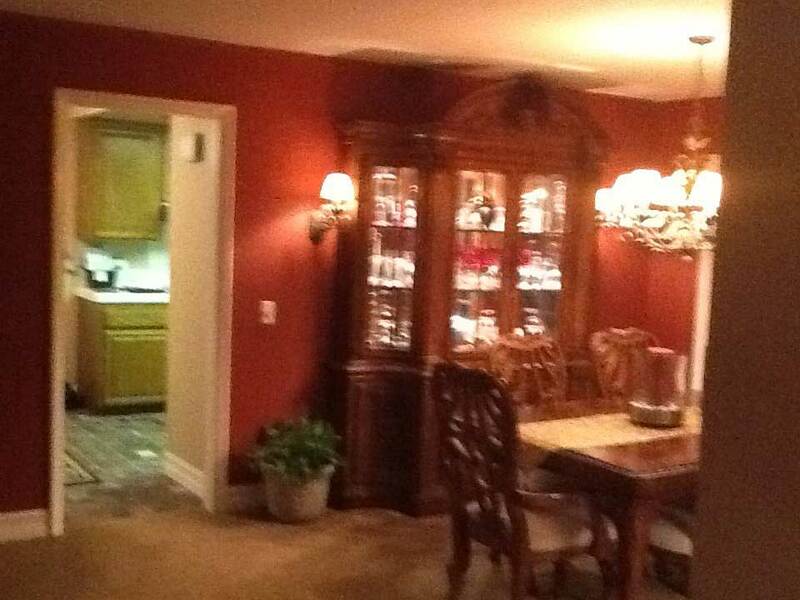 The kitchen was separated from the dining room by a complete wall, with only a narrow doorway leading from one space to the next. 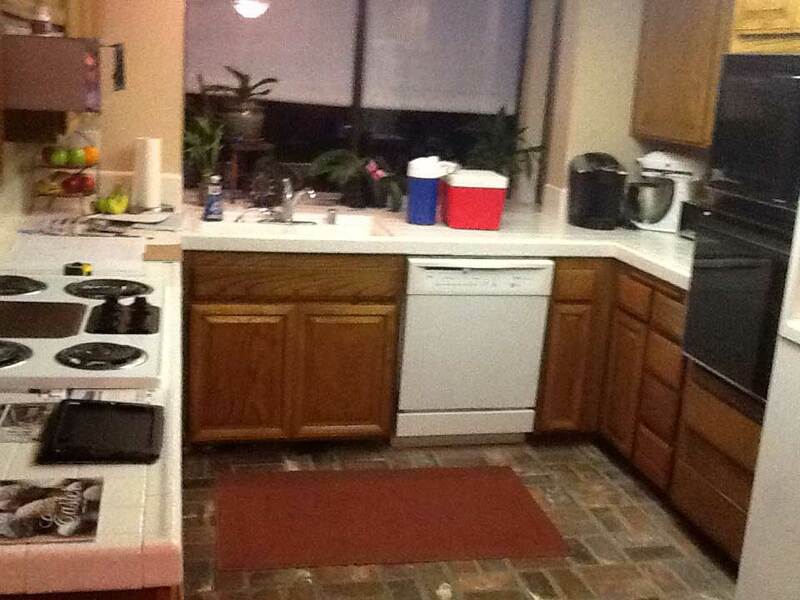 The kitchen was not only small but also lacking in functionality, with incredibly limited countertop space. 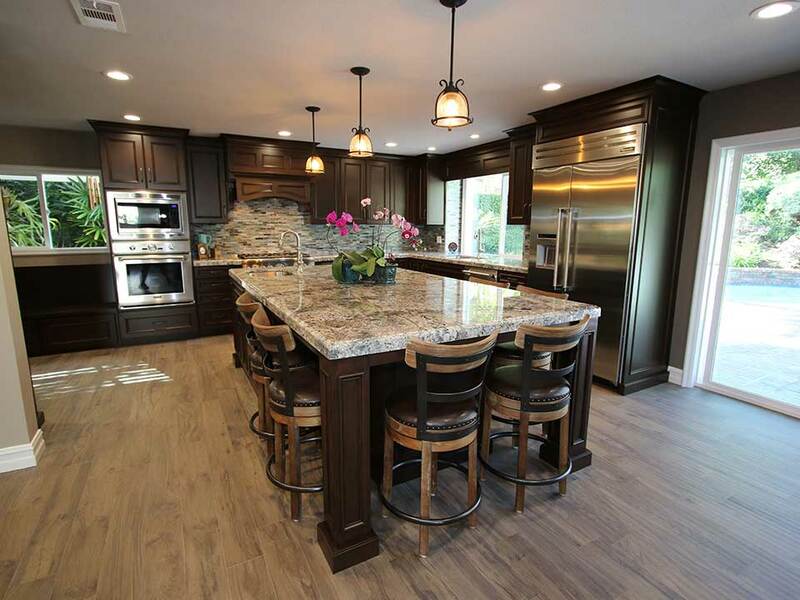 The remodel allowed this Laguna Hills home to be completed transformed into a space that’s large, bright and high-end. This started with the custom cabinetry, designed by the APlus team and built in the onsite shop. 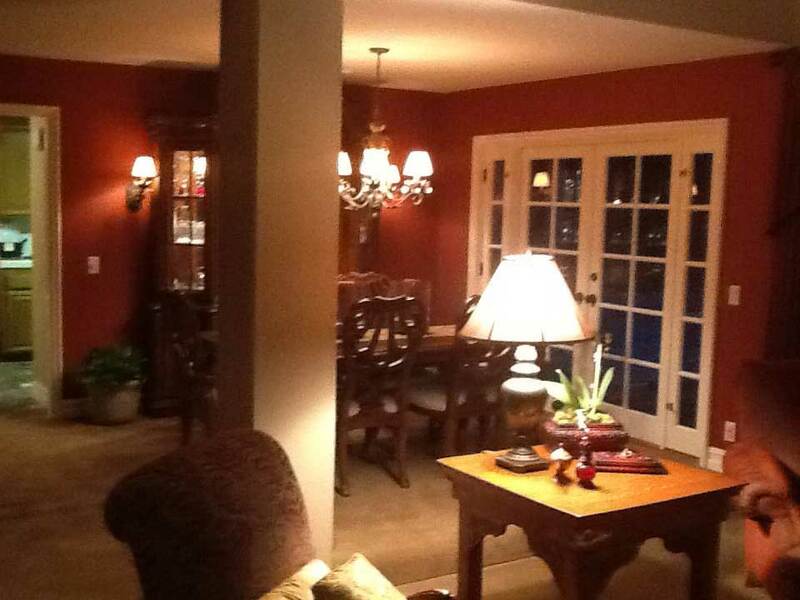 The cabinets are traditional in their style and color. The homeowners selected maple cabinets in the signature Victorian Ryan door style, and they’re paired with a matching edge band. 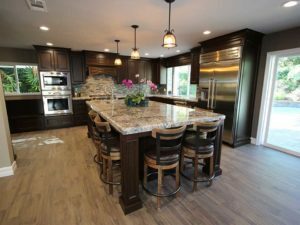 The color, which is so striking in this kitchen, is Manganese, a dark, chocolatey shade of brown that adds depth, richness and a feeling of sumptuousness throughout the kitchen. 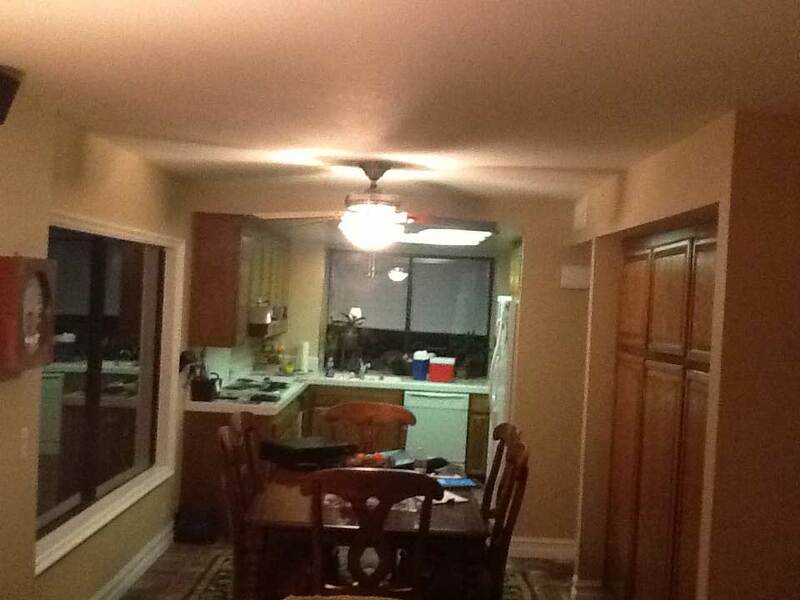 Over the range is a custom hood, and there’s also a valance over the sink. Built into the island cabinets is ample storage including a combination of shelving and drawers. To the left of the double ovens is a custom, built-in banquette-style seating area, with storage underneath. A standalone pantry was designed by the homeowners and APlus to serve as a creative, beautiful place to store food and additional dishes and kitchen supplies. The pantry features a combination of shelves and pull-out drawers and extends to the now-high ceilings. The island is in and of itself a masterpiece in this kitchen. What was once a small space with only a few feet of countertop space has become an oasis. 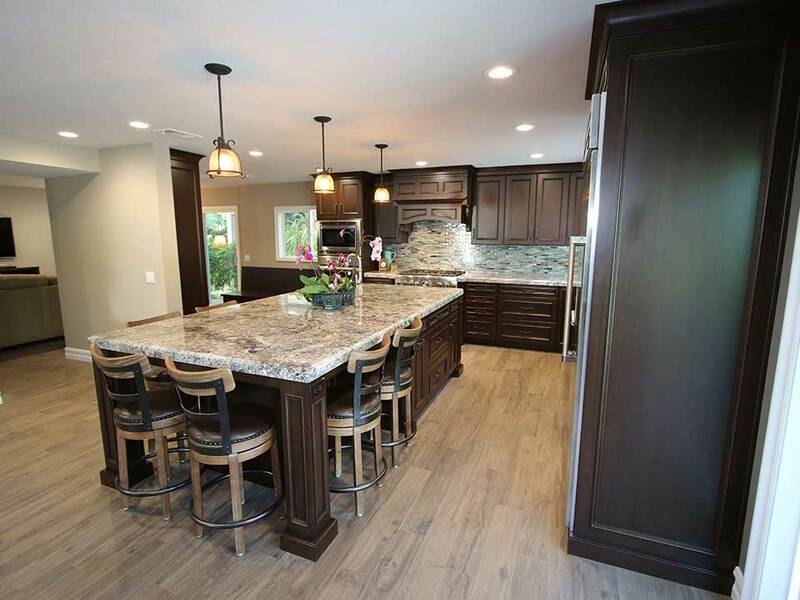 The island features an expansive granite countertop that’s thick, solid and eye-catching. The granite features a cream backdrop with varying shades of brown, black and gray running throughout the slab. 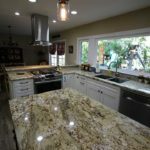 The island countertop is thicker than the granite perimeter countertops, which feature a 1 1/2 -inch waterfall edge. 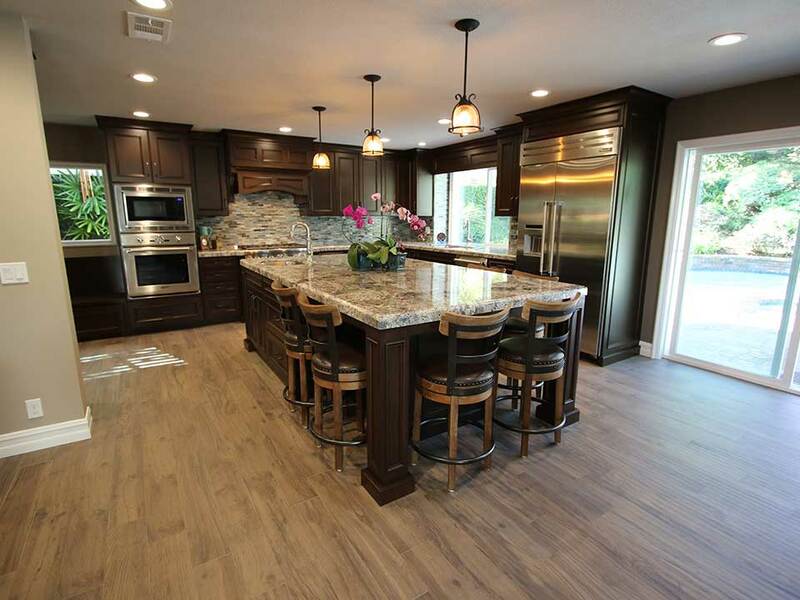 There is not only storage and prep space as part of the island, but also, bar seating on either side. The island also features columned supports on the far end, with more seating and detailed trim additions. A small basin sink adds additional preparation space, and over the island hangs ornate pendant lights adding Old World charm. This is truly a chef’s kitchen, and the appliances reflect that. Along with the double-door massive stainless steel refrigerator, the kitchen also includes a Thermador double oven with soft-close doors and a large commercial style rotisserie, as well as two telescopic racks. The Thermador 36-inch gas Pro Harmony Range features professional grates and a custom hood insert with blower. This kitchen features a backsplash with a horizontal pattern, and glass tiles in varying shades of gray and brown, reflecting the colors of the granite countertops. This backsplash adds depth and dimension to the space. From the kitchen to the family room the choppy design has been reconfigured and smartly opened up, and very light, washed pine-style hardwood flooring with hints of gray undertones runs from in the kitchen through to the family room, tying the design together and uniting what was once a broken and ill-configured design. What brand paint is the Manganese? IT is gorgeous!